If you live in the country or suburbs, you’ve had, are having, or will have water problems. What’s yours? Not enough water? Too much? Tastes terrible? The pump quits? The water’s contaminated? No matter what it is, author Stu Campbell addresses it in this book, and offers down-to-earth solutions in language understandable to all of us who aren’t plumbers. Campbell had coped with water problems in both the East and the West, from the many-state shortages of the West to a cantankerous pump in Vermont. And he’s probed the minds of experts — dowsers, well diggers, plumbers, electricians, and those who know about the flow of water deep underground. In a friendly, knowledgeable manner, Campbell discusses your difficulties. 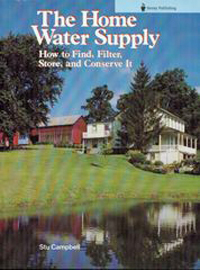 He provides concrete and money-saving answers to questions that range from locating water to digging a pond to hooking up the plumbing in your home. You’ll know when to try something yourself, when to call a plumber or other expert. You’ll learn How to find water. How to move it. How to purify it. And how to store and distribute it in your home. Bob Vogel’s illustrations take much of the mystery out of things as the underground flow of water and how pumps and other water-linked equipment operate.